CoWork 414 is part of a neighborhood. We are among the Broad Street businesses, on the Westside of Bethlehem, near the downtown, in a city, valley and region we love. This week, we are excited to host a Meet & Greet among Broad Street business owners and representatives this Tuesday, April 24, at noon. If you have a Broad Street business and we haven’t talked yet, please contact us! For the Meet & Greet, homemade dessert will be provided, of course. One of the reasons we are excited that CoWork 414 is part of a neighborhood is because of this particular neighborhood itself. The Westside of Bethlehem is a great place to live, work, play and learn. The Westside is a “walking neighborhood,” which means there are lots of people out walking and there are even sidewalks for walking on! Yes, people are often on foot, going to work or school, getting some exercise or enjoying the day. There are a wide variety of homes, something for everyone. Speaking of walking, to spread the word about our upcoming Meet & Greet, we walked door to door and found many people working in their small businesses. These range from shops and restaurants to law offices, and from insurance agents to hair stylists. These businesses are bringing vitality to the neighborhood, and many of them have been doing so for many years. Others are brand new to the neighborhood, like CoWork 414’s downstairs neighbor Bonsall Shafferman Architects and Space Planners. Of course CoWork 414 is new, too, and has space for many other types of businesses. CoWork 414 truly is part of a neighborhood and looking to become very active and supportive. Westside Park is a great place to play and it’s come a long way since some of us moved into the neighborhood, thanks to Mount Airy Neighborhood Association. Higbee Park got a complete makeover several years ago, too. More about both here at the City’s website. Neighborhood kids attend Calypso Elementary School, which we love. And, even as CoWork 414 became an idea and then a reality, we have gotten to watch “the new Nitschmann” (Nitschmann Middle School) rise and even now are very curious about how the new athletic field, currently under construction, will look. So we eagerly anticipate many good new developments! 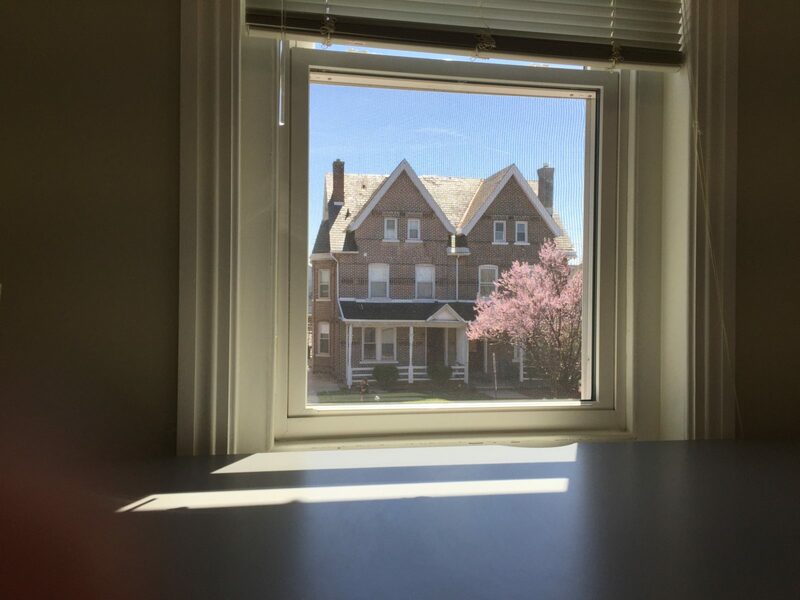 Pictured: A beautiful spring day, as seen from the window of CoWork 414, all part of our neighborhood.